This report provide information about the worksheet detail of each employee. From the Payroll main navigator menu, go to Payroll Forms and Reports>Available Reports>Payroll Item Summary. Then click the [Run] button. Enter the Period Start and End dates and build the report by clicking the [Build Report] button. Once the report, has been built, all the information will be shown in the Results *Preview* tab. However, since this is designed for pivot reporting, go the to the Pivot *Preview* tab. In this screen, we need to identify the row, column, and data fields. 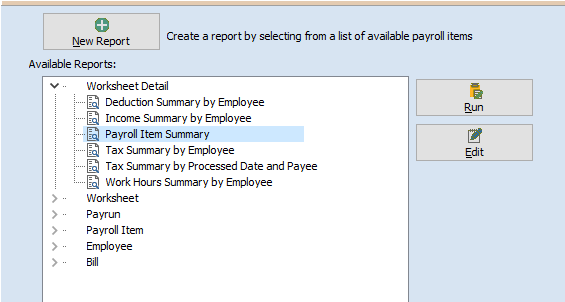 In this report since this is supposed to be and information per employee, drag the employee name field towards the “Drop Row Fields Here” area. Then drag Description field towards the “Drop Column Fields Here” area, as well as the EE Share and ER share fields towards the “Drop Data Fields Here” area. The report generated can be exported to an excel file as well as print it. To print, click the [Print] button to preview the report first. From the Print Preview screen, click the [Design] button in the toolbar to format the report. Set the the Title of the report through the [Title Properties] button. Set the font styles by setting the Font, Color, and Texture. When exiting out of the custom report, click the [Save] button in the toolbar.